Who are We and Why Hire Us? We are at the forefront of technology and its application to web design. We are experts at creating remarkable brands. We are experts at stealing consumers from the competition. We create websites that will blow you away and accomplish your business goals. Basically, we are everything you wish an agency would be. Fact: Woodward Avenue was the first stretch of concrete highway anywhere in the world. The Davison Freeway was the first major highway, and the tunnel between Windsor and Motown was the first underground tube between two countries. Punkgraphic is founded by a creative couple – Aleksandra and Haris Cizmic. With over 20 years of combined creative experience in Europe and the US, (and many Awards under their belts), they are setting new standards in personal / small business website design and production – that can easily compete (and leave in dust) many corporate sites that cost 10-100 times more. PunkGraphic‘s websites are modern (future-proof for up to a year without major maintenance), compatible with latest technologies and trends (WordPress, HTML5, CSS, js, eCommerce (Woocommerce, EasydigitalDownloads), rich photo galleries, payment gateways, SEO and website submission, etc.). 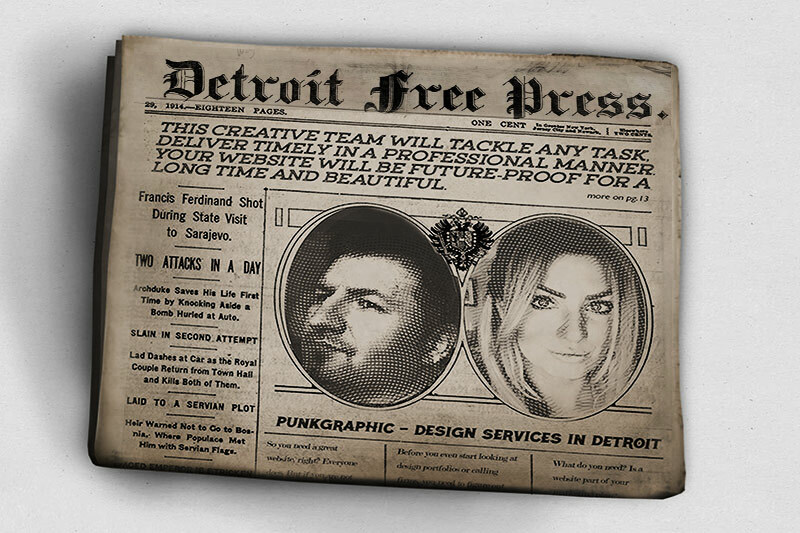 PunkGraphic‘s websites are not only technologically advanced, powered by a cutting-edge technologies, but they are also beautifully designed by this Internationally Awarded couple of artists. They are responsive, elegant digital artworks (mobile and tablet friendly), that utilize modern trends like Parallax effects, full width, single or multi-page layouts and more. Fact: First Ever News Radio Broadcast was in Detroit. You can still listen to WWJ til this day. Going on air in August, 1920, the station was originally called 8MK. We strive to constantly stay on top of the latest technologies, trends, processes and tools. In doing so we are able to help other businesses make the appropriate decisions based on their business needs. The partners listed here are all ones that have helped us, and continue to help us, grow every year. Without these technologies and partnerships we would not be able to provide the high levels of customer service, expertise and results that we are known for bringing to our customers. This creative team and their work was featured in many magazines, channels and publications (including Advanced Photoshop, Layers, InStyle, OverRated, MAX, MTV, VH1, etc). Our work has been published worldwide and seen by millions. We are capable of re-branding your business, advising you on your marketing plan, helping you boost your company’s presence while saving money, and finally creating your professional ads (from Facebook and Google ads, animated banners and homepage takeovers, to magazines, billboards and TV commercials). We build visually compelling websites that instantly reinforce credibility and that drive conversions. Responsive web design allows us to build sites that provide an optimal viewing experience across a wide range of devices—whether you’re on a smartphone or a 27” monitor. Was your website built with the technology and the design foresight to not only automatically scale content for an extremely wide range of screen sizes but also to dynamically prioritize content and adapt on-page elements according to the size of the device viewing the website? Our designs will capture the essence of your company and convey an effective and authentic feeling. Let us improve your branding. We’re not talking about just a logo here. We carry visual identities through everything we produce, from site design and marketing materials to style guides, letterheads, business cards and demo reels and videos. We work hard to design beautiful, highly engaging experiences focused on creating lasting impressions and building brands. Did your website help convert any of your competitor's clients recently? Does Your Website ‘Wow’ People? Is Your Website Better than Competitor’s? Is Your Website Offering Freebies? Is Your website Bringing Enough Sales? If your answer to any of those questions was “No”, then we can help. Let’s start by getting in touch and take it from there. No obligations.